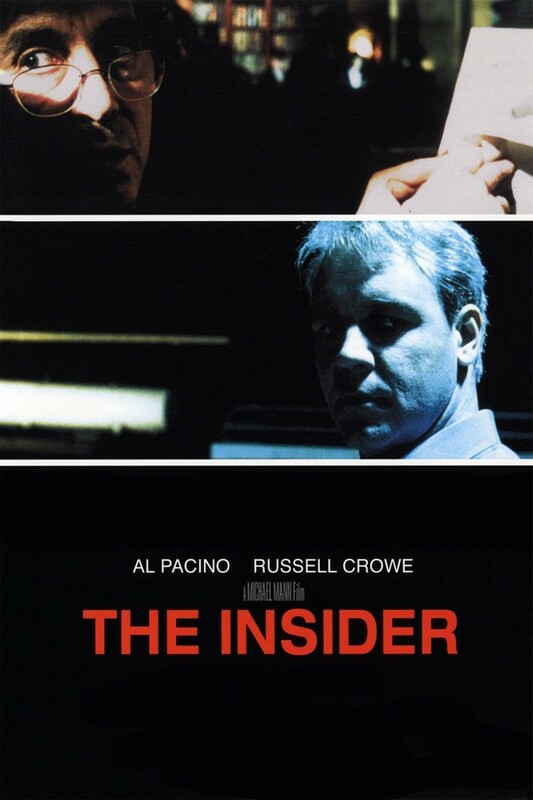 The Insider – Did You See That One? Jeffrey Wigand (Crowe), a research chemist for Big Tobacco, can’t continue to hide the truth about the business. When he decides to go public he quickly becomes the target of powerful people hoping to discourage his efforts. Their personal attacks and threats become more intense as he prepares to tell his story to 60 minutes. This is one of the Best Picture nominees from 1999. The film was inspired by the true story of Jeffrey Wigand. His efforts to out Big Tobacco’s secrets put him at a huge personal and professional risk. The film also works from “The Man Who Knew Too Much”, an article written by Marie Brenner and published in Vanity Fair. The screenplay was written by Oscar winner Eric Roth (Forrest Gump) and Oscar nominee, Michael Mann (The Last of the Mohicans). Mann also directed the film. The cast includes Al Pacino (Dog Day Afternoon), Russell Crowe (Gladiator), Christopher Plummer (The New World), and Diane Venora (Romeo + Juliet). This is a compelling story thanks to writing that immediately acknowledges what is at stake for Wigand (Crowe). The creation of his character for the film is sympathetic and conflicted, helping to generate a lot of empathy for him. This works perfectly with the often-ruthless character of Lowell Bergman (Pacino). The writing plays Bergman in a way that doesn’t allow him to be pushed into the villain or hero category. The moments these two share are some of the more powerful in the film. The dialogue pushes the intensity to high levels. This also gives Christopher Plummer’s character, Mike Wallace, a very interesting intensity. This writing reflects a cutthroat side to journalism that really helps to give the story some depth. Overall, this is one of the more intense dramatic thrillers you’ll find. The acting in this movie is superb. Pacino, Crowe, and Plummer lead the way with their excellent work. Al Pacino does a great job using his trademark intensity while still bringing out the human side of his character. He also has such good chemistry with Crowe and Plummer that allows the whole story to work through him. Crowe also does some great work in a role that called for a more subtle performance. While there are moments where he lashes out, his role really resides in a quiet frustration and fear that he plays perfectly. Christopher Plummer also does great work portraying newsman Mike Wallace. Throughout the movie he seems to build on the underlying ego that allows Wallace to be a leader in his profession. In a smaller role, Diane Venora does a good job with her role. She plays off the emotions and personal effects of the story wonderfully. She also has good chemistry with Crowe, which is essential to the story. Overall, the cast brings this one to life with great performances by everyone involved. This film captures the emotions of the film through wonderful camera work and lighting. The movie sometimes takes on a film noir sensibility through the visuals. This helps to bring out the desperation and fear behind the main character. The movie also features an excellent score, put together by Pieter Bourke (Ali) and Lisa Gerrard (Tears of the Sun). While audiences didn’t flock to this one, the critics found immediate appreciation for this one. This film earned seven Academy Award nominations, including Best Picture and Best Director. Russell Crowe earned a nomination for Best Actor in a Leading Role. Eric Roth and Michael Mann shared a nomination for Best Adapted Screenplay. Dante Spinotti was nominated for Best Cinematography. The film was also nominated for Best Film Editing and Best Sound. Surprisingly, this film walked away empty-handed, losing to films like American Beauty, The Cider House Rules, and The Matrix. This is a must-see for fans of dramatic thrillers. Fans of movies like Michael Clayton and State of Affairs should definitely check this one out. It’s also a good one for fans of the stars. At 157 minutes long, this might seem long, but the pace really keeps it moving. So don’t let the length scare you away. I give this one 5 out of 5 stars. Mann allows for this material to just get more and more tense as it goes along. Even though there’s hardly an action-sequence to be found, it’s all so pulse-pounding. Good review. I think the lack of action hurt this one at the box office, which is unfortunate considering the excellent execution of the material. Totally agree with your assessment. love this movie. haven’t seen it in years tho, so i guess i should rewatch it soon. I loved how a story like this could be done as a taut thriller and keep us on the edge of our seats. Thanks! Definitely make time for this one. Pingback: Spotlight | Did You See That One?